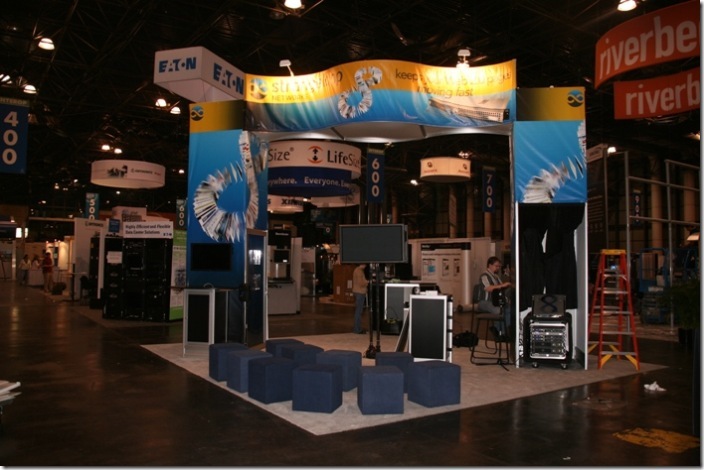 Richard Campbell Blogs Too - Interop Day 3: The Tradeshow Floor Opens! Interop Day 3: The Tradeshow Floor Opens! Not much to say about Day 1 and 2 of Interop - we were too busy getting ready for the tradeshow to get to see any sessions at all. Our booth design for Interop uses a 20x20 island, we're right beside Riverbed. The booth itself has two columns kitty-corner from each other, supporting a central span. This cuts the booth in half. On one side is the reception counter with scanners, documents, etc. The other half is the presentation area, where we have a small podium, a big screen and a bunch of cubes to sit on. This photo is during set up on Tuesday... things are just about finished. You can see the server rack on the right in one of the columns. Its controlled by the laptop on the podium - this is where we do the live demonstrations of the AS1000. On the other side of that column and on both sides of the other column are demo stations for showing how the AS1000 works. Folks really like this booth design, I'm thrilled with it. Lots of other vendors were coming over and taking pictures of it. I feel like we really utilized our space well, the live demo packs people in, and when they have more questions they can move over to the other demo stations to get answers. We're doing three demos on the live station at Interop. One is done by Stephen Forte, the CTO of Corzen. He's talking about how the challenges of Corzen's business in rolling out new features quickly and constantly to their customers. Spending time on optimization is just not an option, they're looking to the AS1000 to minimize that concern. Kent and I are also doing demonstrations, using Visual Studio for Testers to do load tests against the rack with and without the AS1000 to demonstrate how it improves performance and scalability. Carl Franklin is here as well and is video taping the demonstrations so that we can put them up on the Strangeloop site for future viewing.